America's government intervenes in almost every aspect of its citizens' daily lives. From the air we breathe, to our health, wealth, and security, Americans wade through a vast political ocean. Unfortunately, we do so blindly; few Americans understand how or why our government regulates the market mechanisms that surround us. In Markets and Majorities, Steven Sheffrin addresses essential yet overlooked questions about political intervention in economic spheres. Why should we trust the government to clean our air? How do we know what to define as clean? What kind of health insurance business will the government run? What are the dangers of publicly financed doctors? Sheffrin first explains traditional theories of market failure, used to justify intervention. He then combines the crucial question of political viability with the fascinating particulars of policy histories. Sheffrin applies such analysis to the areas of health care, social security, environmental policy, product liability, trade policy, and fiscal and budgetary policy. He argues that beneath each area lies a unique calculus of market failure and political pressures, and convincingly demonstrates that no single policy can be understood out of economic and political context. In short, the fact that markets may fail does not guarantee that politics will succeed. By examining both sides of each policy area, Sheffrin's careful review of our national policy-making reveals a minefield where, in many cases, politics cannot help but fail as badly as markets. However, he shows that all is not lost, citing, among other examples, political intervention in the medical industry as the only hope of stopping hospitals from competitive purchases of useless technology. 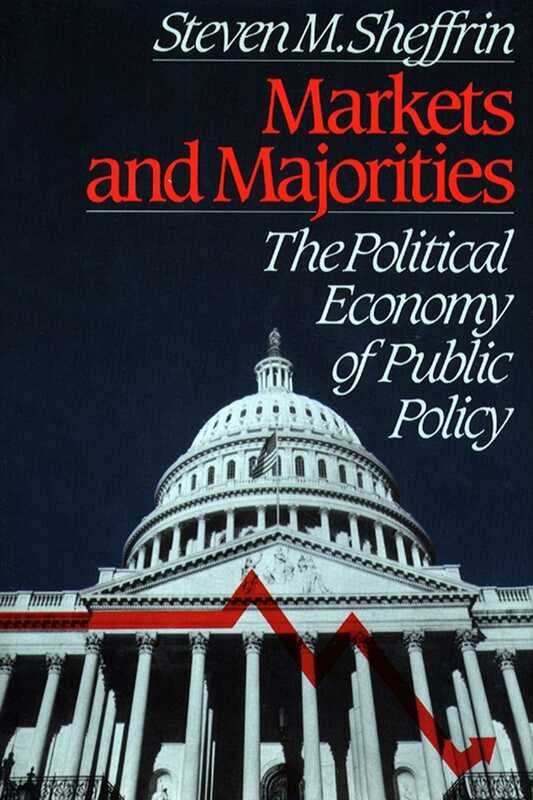 Markets and Majorities is must reading for anyone who has ever wondered why government just can't seem to get things done, as well as anyone who has asked why it should try in the first place. Lecturing in Eastern Europe in the autumn of 1989, I was asked in a reproachful way why I did not urge the economics of Professor Friedrich Hayek as the alternative to the economic system there so obviously failing. I replied that this was not a design which, in its rejection of regulatory, welfare, or other ameliorating actions by the state, we in the United States or elsewhere in the nonsocialist world would find tolerable. The end of the 1980s and the early 1990s marked a victory for democratic society around the world. Dictators in Eastern Europe were overthrown, the Berlin Wall was tom down, and the former Soviet Union began the difficult and dangerous process of fundamental change. As the secrets spilled out from previously closed societies, the truth was even worse than we had imagined: a massive epidemic of AIDS among the poor children of Romania, choking air pollution and retrograde factories in Eastern Europe, and a complete collapse of the economy of the former Soviet Union. Democracy was a clear winner in this worldwide transformation and became the United States' best export. It also appeared that capitalism would be a big winner. As Marxist professors quickly became unemployed (except in universities in advanced capitalist economies), free marketeers airlifted themselves to Eastern Europe and the newly formed republics in the former Soviet Union. In conferences, speeches, and meetings they preached the virtues of self-interest, the efficiencies of competition, and the productive genius of the market. But in this euphoria it is easy to forget an important lesson from the experience of modem successful economies. Sometimes markets work, but sometimes they don't. When markets work well, economic policy is cut and dried: do everything possible to ensure that the private system continues to function freely and without impediments. As an example of successful markets, consider how an Eastern European citizen would view our all-purpose drug and convenience stores. Open all hours and jammed with merchandise, they provide envelopes, toothbrushes, cold remedies, film, greeting cards, and the cornucopia of other items that we just assume will be available. As we learn in beginning economic classes, it is a miracle that this vast variety of items can reach the consumer without any centralized planning or production and with minimal, if any, government oversight. Markets also operate silently. They allocate goods and services, generate incomes, reward the talented, skilled, and lucky and punish the less talented, less skilled, and unlucky. A myriad of decisions about the allocation of resources and the distribution of resources are quietly made, prompting economists to describe the silent working of markets as part of a grand circular flow. Consumers purchase goods and services from businesses that, in turn, generate incomes -- wages and profits -- that accrue to workers and investors and are then reinvested in goods and services. But markets can fail to work. And when they do, the silence ends. When markets fail, governments intervene and impose regulations on the economy. Economic decisions are no longer left to the silent workings of markets but become heavily influenced by politics. The grand circular flow is thus transformed into the noisy and chaotic Washington money-go-round. When Washington politics meets the free market, a host of new actors, new factors, and obsessions come into play. Considerations of political equity emerge from the silence. Experts, scientific or otherwise, are called in to share their wisdom, opinions, and prejudice. Raw political power and other political considerations begin to influence economic outcomes. And solutions to social problems based on reintroducing markets are viewed with skeptical eyes since problems seem to have arisen in the first place because markets were not working. It is precisely at this interface of economics and politics, where markets seem to fail, that the grand debates of U.S. economic policy should occur. We should be asking how markets can be reformed or regulated in a sensible way to achieve our goals. Instead, in the Washington money-go-round we find thousands of lawyers and lobbyists, special interests, influence peddlers, self-anointed reformers, regulators, bureaucrats, and ambitious politicians. All are out to promote their narrow interests or those of their constituencies. In this environment, there are few honest dialogues on economic policy. Instead, discussions of policy often become just another pretext for promoting self-interest. Today U.S. economic policies are made by accommodating the lobbyists and pressure groups. Occasionally policy rises above the fray, such as with the passage of the Tax Reform Act of 1986, which swept many loopholes and sweetheart deals from the tax code. But this exception, a remarkable detour from politics as usual, proves the rule. The Washington money-go-round provides the media with tales of intrigue, power, and influence that titillate the public. Sometimes this mad scramble for economic positioning may seem amusing, but it deflects attention from the very serious business of making our economy work in a time of increased global economic competition. A housing problem? Let's have a subsidy or tax credit. Your industry is losing out to foreign competitors? Try a tariff, quota, or "voluntary export restraint." Worried about the burden of caring for the elderly? Let's start a program of federally subsidized long-term care. Health care costs rising? Let's put price controls on hospitals. Lists like these can and do continue indefinitely. We currently do not have any framework to sort the good claims from the bad. Instead, we rely on the day to day workings of the Washington money-go-round to sort out these claims. Unfortunately, this means that power, influence, and access will often be decisive over common sense and sound public policy. Some reformers claim that the real culprit in our economic and political system is the corrosive effect of money in politics. They promote campaign finance reform as the answer to our difficulties. Put everyone on an equal playing field, they say, and then we will have sound economic policy. But this argument fails in two important respects. First, try as we may, we can never equalize the power of economic interests in our economy. Large, sophisticated interests will find ways to wield their influence. The evils of today -- political action committees and soft money -- were the byproducts of our previous reform efforts in the 1970s. The law of unintended consequences has worked with a vengeance in campaign finance. Moreover, in a free society it is extremely difficult to place limits on political actions. The Supreme Court has ruled that billionaires are free to spend as much of their own money as they desire to run for office. Wealthy heirs are permitted to set up tax-free foundations to promote their visions of environmentalism. And it is naive to believe that large corporations would not find similar mechanisms to influence political outcomes. But there is a more fundamental limitation to campaign finance reform as a solution to our economic problems. Even if we could level the playing field, without a general framework for thinking about policy, we still could not separate the good claims from the bad. The same conundrum remains: there are an infinite number of claimants on public resources. Some basic principles are necessary to decide which claims are worthy of societal support. This book aims to recreate the missing dialogue on economic policy and promote a framework in which to discuss policy rationally. It brings to this task key insights from the science of economics and the art of governance. Through an approach based on understanding the limits of markets and limits of government regulation, it provides a disciplined framework to sort through our difficult economic problems. To begin this process, it is crucial to understand why markets fail to work. There are four broad reasons why markets do not work well. Markets fail to work when they produce distributional outcomes that are politically unacceptable, when there are pervasive individual uncertainties, when markets are missing, and when collective goods or institutional structures must be provided. A first and basic reason why markets are perceived not to work well is that they generate distributional outcomes that are not easily accommodated by the political system. In these cases, the markets may work efficiently -- that is, they deliver goods and services at minimum costs to the highest bidders without any disruptions -- but the political system cannot handle the final outcomes. A good example of this phenomenon is trade policy, a topic analyzed at length in this book. Free international markets are the best way to achieve international specialization and efficient economic outcomes for the world economy. But free trade may hurt some politically powerful domestic interests. These interests often mobilize to impede free trade. Although there are no technical problems with the functioning of markets, the outcomes from market processes are not welcome. Another instructive example is rent control. In the face of rising rents, existing renters may develop sufficient political clout to impose rent controls in the community. Without rent controls, market rents may rise, but the housing market works smoothly without queues or shortages. Developers produce new housing if it is sufficiently profitable. Rent control disrupts the housing market, creates queues and shortages, and, in the long run, leads to a deterioration of the housing stock as maintenance is deferred and new construction comes to a halt. The housing market in New York City is a classic example of the devastation that can be caused by rent controls. Ironically, housing markets perform technically much better before the imposition of rent control but do not work satisfactorily in the sense of producing politically palatable outcomes. The next three reasons why markets do not work well fall into the traditional economists' category of "market failure." Economists reserve this term for situations in which markets do not by themselves produce efficient outcomes. It is not simply that the markets produce outcomes that the public finds unacceptable. When economists diagnose market failures, there are technical reasons why the markets do not operate efficiently. The first cause of market failure involves uncertainty. Markets can handle some but not all uncertainties facing individuals. Living is risky -- there are illnesses, sudden deaths, broken families, and changing fortunes. Insurance can provide some assistance in this risky world. Medical, life, and automobile insurance can partly cushion individuals from risks. But there are well-known limits to insurance markets. Take the example of automobile insurance. Suppose a large group of diverse individuals is covered by a single policy and the insurance company is unable to distinguish or not allowed by law to distinguish between members of the group. The good risks in the group (such as stable nonelderly adults) would like to separate themselves from the bad risks (the single, young, and inexperienced) in order to obtain less expensive coverage. To the extent that they succeed, the quality of the remaining insurance pool will deteriorate. This exodus necessarily leads to higher rates for those remaining and increased pressures for other relatively good risks to exit. Economists term this phenomenon "adverse selection." Taken to its extreme, it can lead to the complete breakdown and disappearance of an insurance market. Other problems with insurance markets arise because individuals can take actions or engage in behavior that insurance companies cannot see. Large insurance firms cannot find out if we drink too much at parties, drive too quickly, or engage in unsafe sexual practices. The fact that individuals have information that insurance companies do not is known as "moral hazard" and also limits the extent to which insurance can be provided. Finally, insurance cannot be provided against events that affect the entire society. Just as a firm writing insurance only in Los Angeles could not insure against earthquakes, insurance firms cannot provide coverage against social outcomes, such as a reduction in the rate of productivity growth. Insurance cannot be provided to cushion against a global drought, a fall in future wages, or the generational struggles that will inevitably occur as average lifespans increase. Our much-debated problems with health care and the Social Security system emerge from precisely these kinds of market failures. Private insurance schemes have not provided everyone with security against illness and aging. Thus the government has instituted elaborate, expensive, and clumsy regulatory schemes, including Social Security, Medicare, and Medicaid. These institutions, in turn, are undergoing radical changes as they try to cope with the same pervasive uncertainties that have bedeviled private insurance. Pollution provides a classic example of the second basic cause of market failure: missing markets. Suppose a company produces steel but pollutes the air. Because there are no markets for clean air, a firm does not have to pay a price for discharging pollutants into the air. If either individuals or the government had a property right in clean air, they would have to be compensated by the firm for the air pollution it caused. With no price on pollution, firms naturally produce too much of it. Pollution is not the only example of missing markets. There are no markets for safety, so the liability system and government regulations try to fill the gap. Recent environmental causes ranging from global warming to preservation of endangered species illustrate other missing markets. The third broad category of market failure arises from the inability of the private sector to produce collective or public goods. Governments must take responsibility for providing these goods. We no longer have private monies issued by banks -- government is now responsible for providing the appropriate monetary framework. With collective spending, such as national defense, comes taxes and borrowing, requiring governments to provide a responsible fiscal environment. Finally, as nation states engage in commerce we hold them responsible for providing a framework for the conduct of international trade. We are so used to thinking of monetary, fiscal, and trade policy as part of the general responsibilities of government that we view failures in these areas as failures of governments, not markets. While this viewpoint is useful, it is important to recognize that these responsibilities emerge for governments precisely because private markets do not provide adequate collective goods and institutions. Political and economic discourse in this arena thus bears a resemblance to the other areas in which markets fail to work. Markets fail to work when they either produce unacceptable distributional outcomes or exhibit technical market failures that become visible to the public. Economists traditionally tend to focus only on technical market failures. But technical market failures become politically important when they cause outcomes that are unacceptable to the public. For example, a monopolist could raise prices for a new drug far above costs without attracting public attention. This would be a case of technical market failure. But if the monopolist began to ration the drug or restrict it to certain classes of individuals, there would be a public outcry. This situation is not only a technical market failure but one the public cares about. In general, this book is concerned only with policy areas that comprise both components: market failure and politicization. Silence is the first casualty when the public cares about markets that fail to work. The political system produces a demand for action that eventually is filled by government, usually through regulation negotiated, supported, refined, and surveyed by armies of Washington functionaries. The first consideration that comes to the forefront is equity. The political system can become obsessed by the apparent inequity of a single program, even though it may have only a trivial impact on overall wealth and fortunes. For example, public utility commissions often develop elaborate programs to redistribute income by means of lifeline rates (subsidized rates for low levels of electricity consumption) even though electricity is only a small part of overall consumer expenditure. For health and social welfare programs, equity concerns are even more predominant. For example, health services provided to the poor are severely criticized if they fail to meet the standards provided to the more affluent, despite the fact that the entire quality of life for the poor -- from education to police protection -- obviously is lower as well. Second, when markets fail, considerations of raw politics or "realpolitik" immediately come into play. This change is perhaps the most fundamental from the usual operation of markets. In air pollution regulation, for example, there is a sharp distinction between the severity of regulations for new firms and those for existing firms. From a purely economic point of view, there is little justification for treating existing sources more leniently. But politically there is a big difference -- existing companies are present to raise their voices in protest, while new companies are absent from the scene. In similar fashion, a firm that closes down and lays off workers because of onerous regulations creates political problems for local officials that do not exist when a new firm is deterred from entering the region because of the same costly regulations. An interesting example of how politics could change the nature of public policy debates comes from the area of education. The debate about allowing free choice in elementary and secondary education is really about the introduction of market forces into a state-controlled system. Allowing market-based free choice, for example with subsidized education vouchers, would remove the politics from many aspects of education and let controversial decisions, such as those involving the curriculum or teaching methods, be made in private and out of the public eye. The educational establishment vigorously opposes educational vouchers for many reasons. Jobs and economic security are obviously at issue. But another important factor is the potential depoliticization of education; that is, taking choices about the curriculum, values, and educational and social priorities out of the public realm and into the politically insulated environment of free markets. Afro-centric or Hindu-centric schools could flourish as easily in this environment as schools that emphasize fundamental Christianity or-the Greek and Roman classics. Opponents of choice in education recognize that government regulation brings political considerations into play in a fundamental way and fear free choice in education precisely because it would diminish the political power of the educational establishment. Raw politics rears its head when markets fail to work. Powerful committee chairmen may protect their regional economic interests at the expense of broader collective interests. Key trade and environmental decisions will be more influenced by elections than economics. Special interest money will flow to politicians to alter outcomes that the markets would have produced. The circular flow of funds takes a detour through the Washington money-go-round. Moreover, when markets fail to work, there is a natural suspicion of government solutions based on emulating the market or creating new markets, as in school choice. In another example, environmentalists typically distrust solutions to environmental problems based on the idea of creating new economic markets for the environment. Economists often advocate creating markets in pollution rights that have the effect of allowing firms to "pay to pollute." Some environmentalists do not believe these market-based solutions will work in practice. Other environmentalists, like critics of the church in the Middle Ages, feel that these solutions resemble the practice of selling indulgences and should be opposed on moral grounds. In their view, introducing market structures and market incentives can impede or even corrupt the development of a growing environmental consciousness. In some cases, this suspicion of markets may be justified. Any economist would tell you that overcapacity -- say in the steel industry -- leads to an industry shakeout and causes prices to fall. Yet, in the medical community, having too many hospitals in any area leads to higher prices for hospital services as hospitals compete for patients by offering new and expensive services. Since insurance policies often pay the entire cost of major operations (after some limited deductibles), patients have no incentives to seek bargain rates. Hospitals, therefore, offer the most expensive, high-tech treatment to lure patients to their facilities. Because the insurance market skews the incentives, competition perversely can lead to higher prices and higher costs. The impact of insurance policies on hospital costs illustrates an important lesson in economics. Any institution, such as insurance, that changes the incentives in markets can have unintended consequences. The same lesson applies to government regulations. Policies that attempt to cure problems can easily create new ones. Public or private medical insurance can reduce risks for individuals but it can also lead to vast increases in the costs to society. Finally, the failure of markets brings forth a call for experts of all kinds to enter the policy arena. We are accustomed to economic experts pronouncing on monetary policy or international finance. But missing markets also attract legions of experts. In the environmental area, for example, scientists of all stripes, often with their own personal agendas, debate the dangers of global warming or of species extinction. Often, neither the public nor the Congress is in the position to judge the merits of experts, and this uncertainty promotes an environment where policy effectiveness may be only loosely related to scientific veracity. At times, Washington seems to be inhabited only by experts -- and these experts advocate every policy position imaginable. But expert advocates are not politically neutral truth-seekers. In the age of big science and big grants, it is hard to find any politically neutral truth-seekers, even in universities. We should not expect to find them on K Street or Capitol Hill. Washington, obsessed as it is with equity, experts, raw politics, and the suspicion of markets, naturally can lose sight of the fundamentals of economic performance and economic efficiency. All too often the result is political failure that rivals the failure of markets. Economic policy making operates at the perilous intersection of market failure and political obsessions. Only when legislators and their constituents begin to understand the compound nature of the problem will sensible and effective answers to these vexing questions prevail. This book examines some of the critical areas where markets fail to work in the U.S. economy. For the most part, attention is focused on those particularly difficult cases in which markets fail to work and there are technical market failures in the economists' sense. These are the most interesting cases because public perceptions of the failure of markets coincide with technical difficulties in the market, thus rendering the economic analysis much more difficult. But economic analysis can only achieve a partial understanding of the problems. Because the failure of markets radically changes the policy environment, the analysis must go beyond understanding the pure economics and extend to political factors as well. Our policy discussions today are paralyzed by reflex ideologies that fail to recognize the dual limits of market and regulatory solutions. On the right, there is a blind spot toward market failure of any kind. With a complete faith in free markets, these partisans can easily view all taxes as impediments to growth and all bureaucrats as parasites living off the private sector. Liberals see failures in markets, but they fail to see the damage that ill-conceived regulatory structures can cause. They are often blind to the biases and distortions caused by bringing politics into economic affairs and by the damage to the economy that can arise in spite of high-minded ideals. The hard left fails to perceive any virtues in the market. For them, government regulation is just a step on the way to centralized control. Sound economic policy must eschew all of these false ideologies. The strategy followed in subsequent chapters is to first understand why market solutions are inadequate and then understand the logic of the existing regulatory structure and the politics that surround the problems. Only with this background can suggestions for change and reform be understood. This approach contrasts sharply to the reflex debates between ideologues today and often leads in surprising and somewhat unpredictable directions. The book is divided into three parts that correspond to the three basic technical reasons why markets fail in the economists' sense: pervasive individual uncertainty, missing markets, and the need for collective provisions of goods and institutions. Each part not only highlights why markets may fail in a narrow technical sense but emphasizes the consequences when they fail to work in the broader sense of the term and the subtle interactions between the two. A final chapter summarizes the key conclusions and provides principles for reform. The first part, "Economic Security and Pervasive Risks," includes the provision of medical care, the Social Security system, and the problems relating to an aging population. As medical expenditures now account for 14 percent of gross national product (GNP) and Social Security taxes now outstrip income taxes for the average worker, there is legitimate concern that our current systems cannot continue without radical restructuring. Chapters 2 and 3 discuss alternative health plans, the equity and solvency of the Social Security system, and demands for long term care for the elderly. Part II, "Regulation with Missing Markets" focuses on two important areas: the environment and the liability system. In both areas missing markets have led to the development of regulatory systems that have created extensive political controversy. Chapter 4 covers air pollution, global warming, pesticide regulation, and species preservation. Chapter 5, on liability, focuses on the costs and benefits of regulating safety through the tort system and the liability crisis that besets us. Part III, "The Search for Governmental Structures" covers trade, monetary, and fiscal policy. Although these areas are often treated as basic economic issues, their political aspects make them most interesting and most difficult. In trade policy, the issues revolve around nations that like to promote their exports and protect their imports; in monetary policy, the issues are who should control the money supply and how should it be controlled; and, in fiscal policy, the most interesting issue is how to control our politicians. Basic economic thinking underscores the analysis, but the discussion quickly leads to the political economic aspects of the problems. The overall approach of this book is summarized in Table 1-1. Policy issues do not emerge in a vacuum -- they are generated because of inherent failures either in the market structures or in the political system. These market and political failures give rise to regulatory structures that try to cope with these problems. Regulatory structures are by their very nature imperfect and bring forth new concerns and issues. Table 1-1 illustrates this dialectic of policy for the areas treated in the book. For example, our health care system is plagued with rising costs and problems of access. Fundamentally, these problems are caused by the inability of insurance markets to process the pervasive risk in the health system. Our most recent regulatory responses have been to promulgate government-sponsored health insurance and impose direct regulations on hospital costs and physician fees. But the health system is still failing, and further regulation and fundamental change stemming from the debate on a national health policy remain possibilities. The stance toward economic policy taken in this book -- identify where markets fail, understand the logic of the regulatory structure, and only then advocate policies that have sound economic and political features -- is more difficult and less predictable than conventional economic analysis. Perhaps highly partisan free marketeers or central planners could find solutions compatible with their beliefs in all areas. This outcome may be the product of either a strong mind or a closed one. For most of the issues presented in this book, it is not difficult to understand the alternative argument. In each chapter I recommend reforms and actions that are based on explicit underlying political and economic assumptions. Thinking through the consequences of these assumptions after an informed analysis of the issues and of the regulatory structures is what is required when markets fail. I am proposing an approach -- a style of thinking -- that excludes ideologically charged or politically motivated conclusions. Such an approach can discipline policy choices and raise decision making above the Washington bazaar. The results of these exercises are often surprising. Some centralized government control may be required in medicine, but greater decentralized efforts by nations in their pursuit of free trade may be the best policy. In the environmental area, regulations for air pollution work reasonably well, but those governing pesticides and species preservation are not working well. Few changes are needed in the framework for monetary policy, but the framework for fiscal policy needs substantial reorientation. The final chapter brings together the important themes that emerge from the approach taken in this book. Not all readers will agree with all the conclusions, but I hope they will be forced to think through, in a disciplined way, the political and economic complexities in play when markets fail to work. To make informed judgments on policy, however, requires the proper intellectual background as well as access to the latest information. To assist readers in thinking through the policy issues, each chapter is followed by some suggested additional readings. To assist in obtaining the latest information, the book concludes with "An Annotated Guide to Washington Think Tanks and Sources of Policy Information." This guide provides an orientation to the intricate world of Washington think tanks, including names, addresses, phone numbers, publications, and political orientations.